Option for 38.1mm diameter tube. Option for 50.8mm diameter tube. Requires fixing with a high strength Stainless Steel Adhesive. 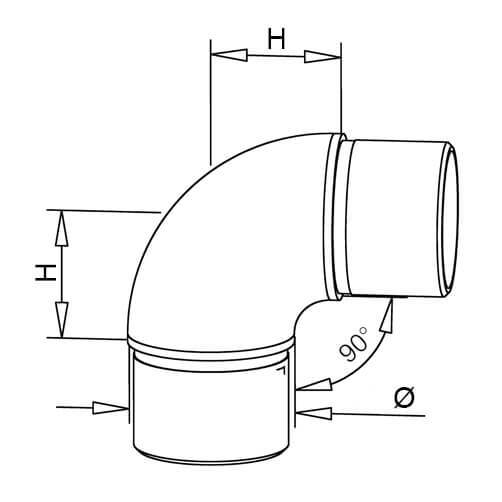 Tube Connector with curved 90 degree angle elbow for flush connection of bar railing tube. Quick and easy to install, just glue and slide your stainless steel tubing on to each end for the perfect rounded corner. Manufactured from Zintec/Protectan with a brushed stainless steel effect finish. 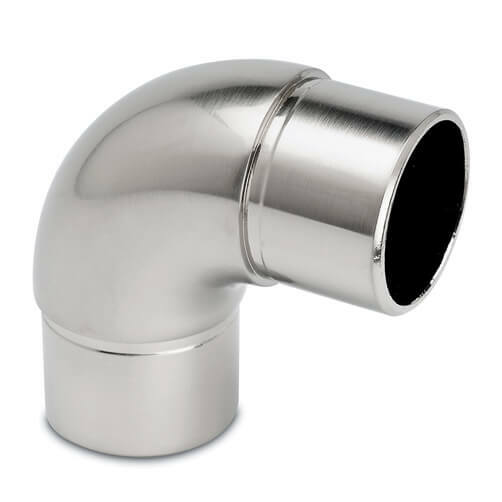 Available for both 38.1mm (1.5 inch) and 50.8mm (2 inch) diameter stainless steel tube. High strength adhesive is required for installation. Zintec is created by using the process of electrolysis to coat mild steel with a thin layer of zinc metal. The advantage of Zintec is added corrosive resistance. 1. Ensure the inner end of tube is clean and free from dust and debris. 2. Apply high strength stainless steel adhesive to inner surface of tube. 3. Push fit connector firmly into tube end, you may wish to use a plastic hammer to do this, (Important : never use a metal hammer as this will mark or damage your end fitting). Wipe away any excess adhesive and allow to set. 4. Clean and apply adhesive to second tube. 5. Push tube onto the connector elbow. 6. Wipe away any excess adhesive and allow to set thoroughly before use, (Tip : You can polish away any adhesive residue or scuff marks using WD-40 or Q Clean). Stainless Steel Tube high quality tube for bar rail fittings. Foot Rail Brackets stylish fittings for bar railing. Stainless Steel Adhesive for high strength fixing.